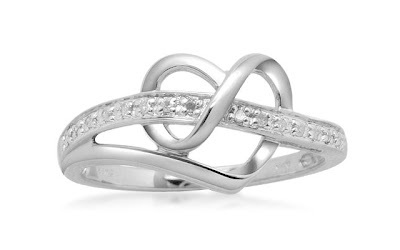 This Sterling Silver Diamond Heart Ring (Ring Size 6 or 7) is currently selling for just $32.00 on Amazon.com! You will be saving 58% off the listed price of $76.55 with this jewelry deal. This ring is also available in Ring Size 8 for $35.10. What I like about this diamond heart ring is the unusual design. It looks like a cross between a heart ring and an infinity ring.